Clinical social worker Bette Freedson shares seven key insights she has identified through years of workshops, counseling sessions, and her own self-examination as a single mother. 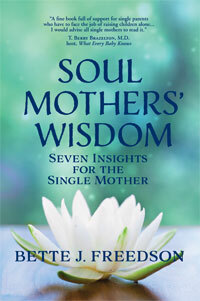 In Soul Mothers' Wisdom: Seven Insights for the Single Mother Bette Freedson gently guides often-overwhelmed single mothers to a strong personal identity, a rediscovery of resilience, strength, and courage, and an affirmation of parenting purpose. Soul Mothers' Wisdom helps the woman parenting on her own understand that she can create the life she wants and become the woman she desires to be, transforming challenges into opportunities and solutions, chaos into calm, and discovering (or re-discovering) all she has to offer to her children and her self. Mental health professionals agree—children have a better chance of becoming emotionally healthy adults when their mothers' choices are guided by the wisdom that emanates from a solid core of self, i.e., "soul." Soul Mothers' Wisdom: Seven Insights for the Single Mother offers single mothers the knowledge, counseling and affirmation to help them and their children thrive. and just plain hard work that motherhood requires in our contemporary world. is also available in a Kindle edition ($6.99)." "The responsibilities of single mothers can be daunting. Soul Mothers' Wisdom provides inspiring counsel to help them flourish. their identities, and improve the lives of those who depend on them." "Bette Freedson has written a winner in Soul Mothers' Wisdom. as well as her years of practicing psychotherapy—are infused with compassion and wisdom. for anyone navigating these often-confusing and painful waters." "For twenty-six years I've had a solo general practice of Osteopathic medicine. and is the centripetal force that keeps us on the spiral path." "Bette Freedson has written an enormously useful book on single parenting. from shock and despair through adaptation after successful adaptation. This book gives advice and hope to so many overwhelmed parents traveling the same path. building self esteem, and handling misbehavior to be on target and helpful. Single mothers will find this inspirational book to be a valuable resource." the inevitable challenges and hardships of single motherhood into blessings. to the heart of the matter, and inspires trust in the reader. rather you will feel encouraged, as well as connected to Spirit and the human family. is both readable and useful." Bette Freedson reminds us that being a single parent is just one attribute of a full person. As single parents many of us feared we were wreaking havoc on our child or children. Freedson reminds us of the positive attributes we can bring to our parenting and to our children by finding the silver lining and coming to a place of acceptance and joy. She releases readers to find their souls in the midst of their circumstances. "You can see in Freedson's writing that she is a therapist in the best ways. in the way Freedson reaches out her arms and says 'you will be great, you'll turn out OK!'" "Soul Mothers' Wisdom shines with abundant hope, encouragement, inspiring stories, manageable and memorable tools, powerful affirmations and opportunities for personal reflection. Single moms, come dip your cup into the life affirming well of Soul Mothers' Wisdom. Draw up the inspiration, the peace and the guidance that flows in these healing waters. You can drink in the truth that together you and your children can grow strong, resilient, joyful and whole. Liquid light will lift you as you embrace your new life. Soul Mothers' Wisdom is indeed a healing gift." and stress women into believing that one person cannot do a two-person job. that will be dog-eared by those who are willing to learn and practice what her experience, wisdom, intelligence, humor, kindness and enthusiasm has manifest. This book could pertain to anyone." I have learned a lot about the courageous and resilient women whom society calls single mothers. We are a diverse group of mothers—and grandmothers. We are women whose mates have deserted us for parts unknown, women whose partners are in far corners of a giant world, keeping an unstable peace. We are mothers of children whose fathers have been rendered unavailable by business, emotional disability, illness, divorce or death. Some of us have chosen to leave our relationships, or to adopt or give birth to a child on our own. Some of us have even made pilgrimages to bring home babies abandoned by other cultures. Whatever the circumstances, we have this in common—we are largely, if not completely, in charge of our children. We are of every color, race and religion. We are capable, adaptable, and resilient, often discouraged and almost always determined. On the road to greater maturity, we regularly become exhausted and overwhelmed, and sometimes experience exhilaration. We may have supportive families or we may not. Some of us work, some receive aid, but rich or poor, we strive with whole hearts to do the job of raising our children well. Each of our stories is unique and amazing, embodying the pain and strength from which we can build a foundation for strength and maturity. Regardless of how we have entered this overpowering and inspiring life, we share a major common denominator—every day of our lives we are working hard with little time for ourselves, even though we need that time badly. We are tired and we are resolute. As we cope with all our circumstances, we strive to solve our problems, create fulfilling lives, and give our children what they need to grow up well. There are times when our bones ache, and times when we vibrate with energy. Always we crave support and long for understanding. In this book I share my own story as well as the stories of other single mothers. I trust that through these stories you will recognize your own strength and gather Soul Mother Wisdom. Sharing what I have learned about healing, succeeding and becoming wise is a current step in my own journey as a single mother and as a practicing psychotherapist. I offer you what I have discovered about how to think, how to manage stress effectively, how to make, and trust, your decisions, and how to muster up the inner resources of courage and hope when things seem bleak. I believe that we can do a better job as single mothers and can feel better about our lives when we know ourselves better and know how to cope with what life deals out.